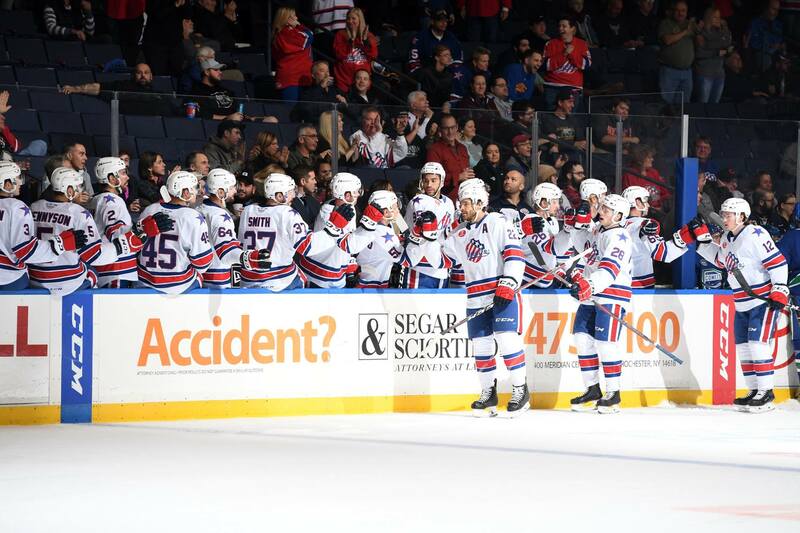 Recap of 2018-2019 Amerks Regular Season Stats · Let's Go Amerks! The Rochester Americans return to the ice Wednesday morning to prepare for the 2019 Calder Cup Playoffs and continue the goal they set in the preseason – to be an elite playoff team. The regular season was just about as good as it can get in terms of stats and finishing third overall in the league. The legacy of this season will be determined by what happens in the playoffs. There’s a lot of hockey left to play so this is by no means a season recap, just capping off what happened in the regular season. There’s a lot left to be written. Top ten in franchise history, third overall in the league, and second place in the division. It was a great regular season. The overall success of the season will be determined by the playoffs. The season preview article was titled “Elite Playoff Team or Bust” and that still holds true. They were an elite team throughout the season, now on to the post season. They were great on the road and pretty good at home when there was less than 5,000 fans in the building. For a full breakdown of the home and away record click the link below. Overall the Amerks finished third overall in the league with 254 goals scored, only one behind Syracuse in second. The 218 goals against ranked them 12th overall in the league. Six players scored 20 or more goals with Victor Olofsson leading the way at 30. I had written in the season preview that we could expect 60 goals from CJ Smith, Wayne Simpson, and Danny O’Regan. They scored 69 goals overall. Rasmus Asplund had 2G+9A in the first half of the season and 8G+22A in the second half. Development. Iron Man: Eric Cornel was the only player to play in all 76 games. The team has enjoyed scoring goals in the third period. They’ve also enjoyed giving up too many in the second and third. A stat that wasn’t tracked and could be a summer project is goals in the first or last two minutes of a period because it felt like the Amerks gave up a lot of them. Scott Wedgewood finished second in the league with five shutouts, one behind Kaapo Kahkonen (Iowa) who had six. Wedgewood also finished second in the league in wins with 28, just six behind league leader Alex Nedeljkovic (Charlotte). The wins and shutouts were great. Save percentage and goals against not so much. Wedgewood is the first Amerks netminder to post five shutouts in a season since Ryan Miller had eight in 2004-05 and will conclude the season just two wins shy of reaching the 30-win mark, a feat last accomplished by former two-time MVP David Leggio, who posted 38 victories during the 2012-13 campaign. An attempt to put the power play and penalty kill into chart form below. The team started with the best power play off a hot start from Zach Redmond, Lawrence Pilut, and Victor Olofsson. 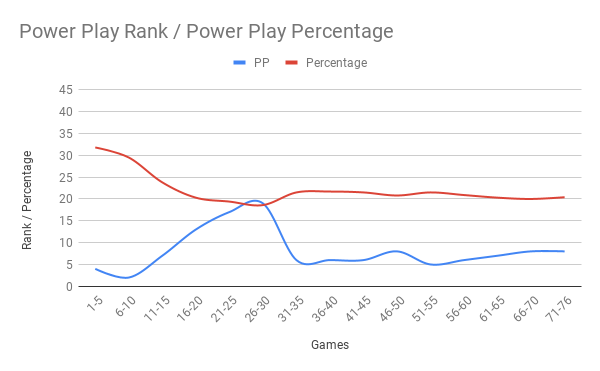 Once Pilut was called up to Buffalo the power play struggled before leveling out. 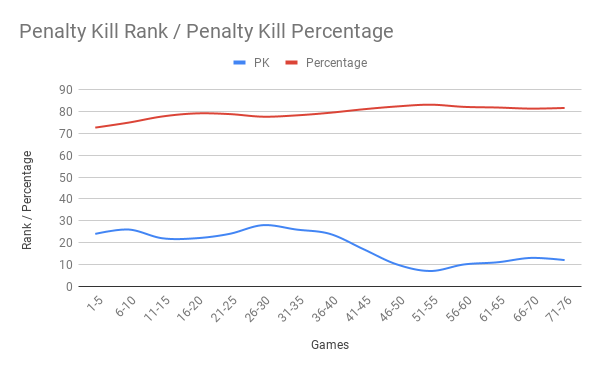 The penalty kill struggled in the first half of the season before figuring things out and ranking in the top half of the league. Anyone who follows @LetsGoAmerks on Twitter recognizes that we’re supporters of Dalton Smith. He’s a difference maker (see the article linked above) on the team and a fan favorite. There’s been a running stat all season that shows the Amerks were better when D Smith played compared to when he didn’t. Alex Nylander is a polarizing player. Anyone that has watched him in Rochester has often been frustrated. Anyone that has watched him in Buffalo has been impressed. Put the two of them in a lineup (they never play on a line together) and there’s success. Is there an actual connection with some muscle in the line up? It sure seems that way. I’ve tried playing with other scenarios and haven’t been able to find a connection with such a difference in results. More than anything it’s a fun stat with two players that are complete opposites. Overall the team used 44 players, one lest than last season. The number is artificially bloated after by adding four players for the last game. Pascal Aquin, Ukko-Pekka Luukkonen, Tobie Bisson, and Devante Stephens were called up for game 76 when nine players went back to Rochester early. Buffalo was also pretty hands off as well in terms of a rotating roster with players going up and down. A bulk of the games lost to injury this season are linked to Andrew Oglevie (46). Last season Barry Goers missed 63 games due to concussions as well. Sean Malone and Kyle Criscuolo each missed the highest number of games in the 2018/2019 season at approximately 33 games. The word approximately is used because these are unofficial totals but as close as we’ll get. The team doesn’t provide the number but I tracked each game when someone didn’t play and why. The team was incredibly deep this season which allowed extra recovery time as necessary and some games off that could have been played if they were playoff games. Less players used in the roster, less players lost to injury. Two more categories that have trended in the right direction year after year. This will be held off until hopefully late June. Final grades will include both the regular season and playoff performance. I tried something new with five game recaps vs weekly recaps to try and look at things from a bigger picture than just two or three game stretches over a weekend. It worked in terms of tracking performance and if you read them, thank you. Will take a different approach next season. Playoff articles start tomorrow. Playoffs start Friday!